Info sheets can be blatant exaggerations, but once you read that a band plays such dirty guitar riffs they should have moustaches, you know you’re in for the real deal. I somehow managed never to notice Every Time I Die before, and was then more than a little surprised to learn that their fourth album made an entry to position 41 in the US Billboard Charts. And the cool thing is: these guys don't even sound commercial. What may feel like metalcore on the surface goes much deeper. 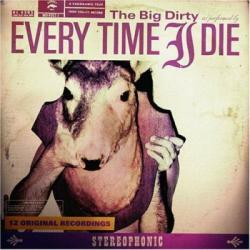 Crossbreeding stoner with Southern rock, and mangling it through a heavy metal meat grinder, The Big Dirty describes itself already well enough with its album title alone. Add to this some of the tongue-in-cheek’est song titles ever (We’rewolf, Rebel Without Applause, Rendez-Voodoo, INRIhab with the Alexisonfire vocalist helping out), and you really start to wonder how such an intelligent band could even become so famous. Vocalist Keith Buckley provides a really impressive performance, shouting his lungs out of his chest, but his brother Jordan and co-guitarist Andy Williams underline his crazed messages with truly dirty chop attacks. The Big Dirty manages to be subtle and un-subtle at the same time, playing redneck metal with an ironic distance that should allow them to reach audiences of all IQ’s. It’s great to see that there are still bands out there that find their own niche, thrive in it and even get the deserved success. This is stoner metal for the new generation.